AGE Explorations are short, experimental products for the Adventure Game Engine (AGE) that expand the rules in different directions. Each entry in the series presents new game mechanics, systems, or other content to help change the way you play. Add just the Explorations products you want to your AGE campaign to get the style of play you're after. Change your game with AGE Explorations! 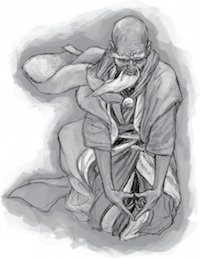 Paladins and priests, shamans and monks, the pious and the revered from virtually any faith you can imagine, they all gain new options and potency in your AGE-powered campaign when you add in this product's centerpiece: the Divine Gift talent. Acclaimed game designer, Steve Kenson, crafted the Divine Gift talent to add divine powers to any character class in the Adventure Game Engine, deepening your world's lore and your players' options for leveling up along the way. This material, originally published in Kobold Quarterly magazine, has been revised and expanded with two new backgrounds suitable for characters with religious roots. Whether your character is a devotee of Love or War, a practitioner of Law or Chaos, or a servant of Fate, this kit offers ways to demonstrate the power of her faith. The Adventure Game Engine (AGE) is the system that powers Green Ronin's Dragon Age RPG. AGE branded products are fully compatible with Dragon Age, but can be used in many different settings.